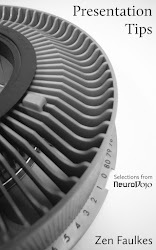 NeuroDojo: Who paid for my open access articles? Who paid for my open access articles? 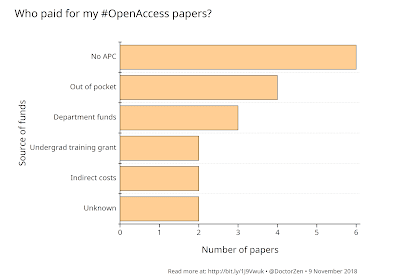 A recurring concern from some researchers about open access is the cost to authors. This is an area of persistent misconceptions and a lot of fear. It’s a legitimate question of whether article processing charges create a Matthew effect, with labs with grants gaining an unfair advantage over those without grants. Or, worse, shutting out contributors entirely. This interests me, because by most standards, I am a scientific “have not.” And yet, I’ve published many of my articles open access for some years now. I did not have stand alone research grants in that time. How did I do it? Lately, I’ve been fortunate to have my chair agree to support article processing charges of a couple of some papers from departmental funds. I paid the costs of a couple of few papers out of my own pocket. The two PeerJ papers were covered by a single lifetime membership, which was $99 at the time. I paid the costs for two using indirect costs recovered from an external undergraduate training grant that I was awarded. Finally, I don’t know how the article processing fee my most recent paper was the papers below were paid for by my co-authors. 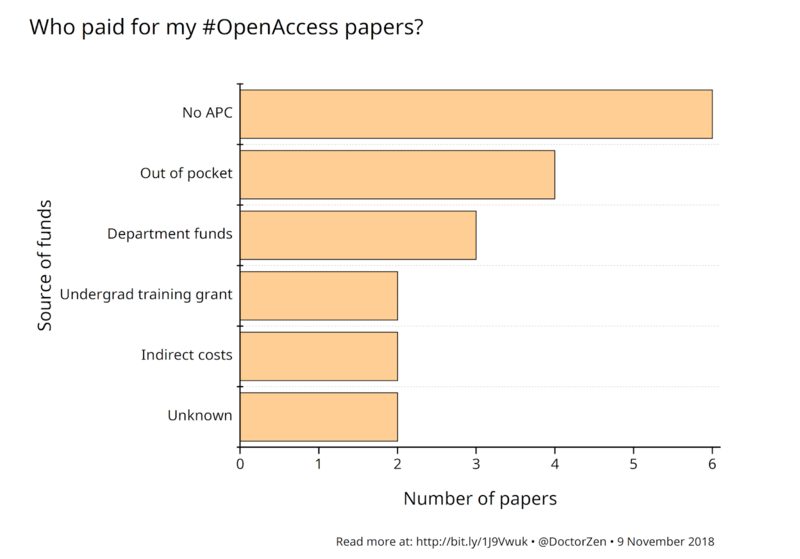 Looking at this list, I’m willing to bet that some researchers will say, “But Zen, even if you didn’t have traditional research grants to pick up the tab, you’ve still had a lot of support to pay for open access.” True. It’s hard to say if the number of open access papers would have been much different if, say, my department declined to pay for papers. I might have tried other journals, might have dipped into my pocket again, might have tried to find other pots of money. 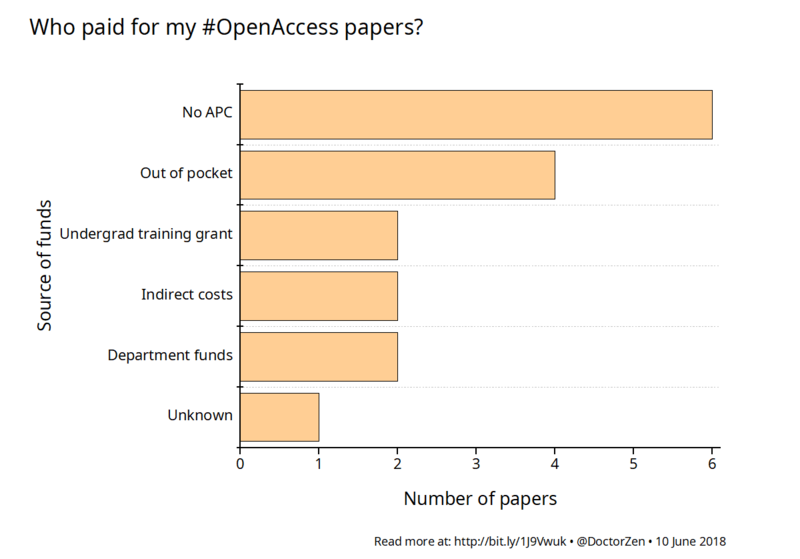 From this perspective, the issue that might stop some researchers (retirees and amateurs, say) from publishing open access would not be “lack of grants,” but being disconnected from larger institutions. Being part of an institution brings a lot of infrastructure, and diverse resources that go way beyond who has external grants. All of that said, several of my articles in “traditional” subscription-based journals also had page charges (one journal asked me for $320 for its 2.75 year publication process). It’s interesting to me that people don’t very often bring up those page charges as barriers to publication. Additional, 17 March 2015: Updated list. Additional, 2 August 2015: I added two new papers to the main list: one had no publication fees, the other was modest (PeerJ) and paid for out of pocket. Additional, 18 November 2015: Added newest paper to list (reasonably low fees that I will pay for out of pocket). Additional, 20 January 2016: Updated the list. One paper that I thought might cost me something ended up costing nothing. I also completed some citations. Additional, 7 February 2017: Updated the list. 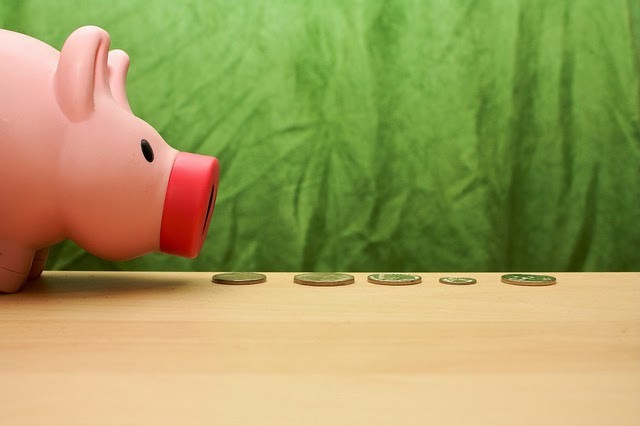 Second time I dipped into some funds I have from indirect costs. Additional, 10 June 2018: Updated the list, adding two more papers. And here’s a graph! Additional, 18 June 2018: Updated the list, with one more paper. Graph above not updated yet. Additional, 24 September 2018: While tweeting out this link again, I am reminded that I need to add Hilda Bastian’s important blog post about open access fees. 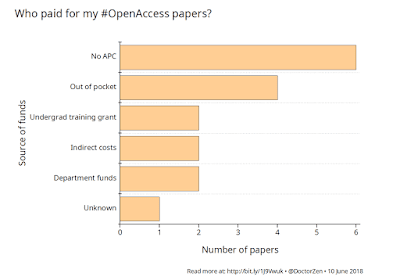 (N)ot having an APC doesn’t mean the journal is accessible to everybody. It has to accept work from your field. You have to be eligible to publish in it – an APC is not the only possible access issue. You have to write in its language of publication. And you want it to be accessible to people in your field. In mine, that means you really want it to be indexed in PubMed. And having DOIs is critical for citations to be counted by key systems. Hilda does a little analysis to show that this winnows out to a small number of journals for most people. Additional, 9 November 2018: Updated the list, with one more paper. Graph updated! Photo by penguincakes on Flickr; used under a Creative Commons license. I’m a People of Canada! Tuesday Crustie: I like spikes!